The son of Hercules Skinner, a Scotsman, and an Indian Rajputni. This couple had three sons and three daughters, James being the eldest. Hercules was determined to have his daughters educated even though he knew that his wife was immutably opposed to it on the grounds that it violated her Rajput honour. She felt so strongly about it that she killed herself. It is hardly surprising that such determined parents should have a son who grew up to be a famous and charismatic leader. James was educated first at a charity school then at a boarding school. His first employment was as an apprentice to a printers in Calcutta but he hated it and ran away, supporting himself with odd jobs in the bazaar. He was found and taken back home. His next job was with a law firm, copying papers which did not suit him either, so he was relieved when his godfather arrived in town. James told him of his wish to be an officer in the army and the impossibility of realising his dream because of his Indian blood. The godfather suggested that he serve in the Maratha army instead and wrote a letter of introduction for him to the French general, De Boigne, who commanded them. He was taken on as an ensign, serving for 8 years until 1803. During this time he fought with great courage against various rival chiefs of central India and Rajasthan. The worst time of his life happened after a battle at Uniara in January 1800. They were fighting a rearguard action in which only a few of his men survived. Skinner was left for dead, having been shot in the groin. He lay unconcious from early afternoon until dawn the next day. He had no food or water and lay in terrible pain for two whole days, keeping jackals at bay and not being able to reach other wounded men crying out. His life was eventually saved by an untouchable woman who gave him bread and water. He was taken to the enemy camp where he was well treated and released as soon as he was well enough. He sent 1000 rupees to the old woman who saved him. There were other campaigns to be fought when he returned to service, notably against a man called George Thomas who was an adventurer who had set himself up as a ruler at Hansi in the Punjab. They attacked him at a fort called Georgegarh but he made a desperate escape and was eventually forced to surrender at Hansi. When war broke out between the Marathas and the British, Skinner and other Anglo-Indian officers refused to fight and were dismissed. He was persuaded to work for the British although he nearly changed his mind at one point when he came up against the inevitable prejudices. But Lord Lake persevered and he agreed to a cavalry command on condition that he did not have to fight his old master, Sindia. After the defeat of Perron's army at Delhi, 800 horsemen deserted to the British and asked to serve them with 'Sikander Sahib' as their commander. Anyone who has seen the film The Man Who Would Be King will know that Sikander is the local name for Alexander (the Great) whose empire reached north-west India. And so was born the famous Irregular Cavalry Corps that became Skinner's Horse. 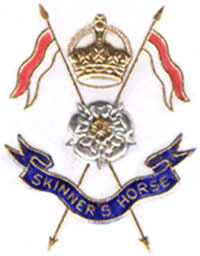 Skinner's corps served the British well so it was a blow to him when, three years later, it was ordered to be disbanded for reasons of economy. He was allowed to retain a nucleus of the regiment and given a grant of land and an income of 20,000 rupees a year. Later it was decided that as a British subject he could not own land in India, so he was reduced to a colonel's pension of 300 rupees a month. Then in 1809 he was ordered to re-raise the corps.. This cycle of reduction and build up happened again in 1819 -1825 during which time Skinner spent a very quiet 2 years. In 1826 he was to be made a Companion of the Bath until it was realised that he was not of high enough rank. It had long been a source of bitterness to Skinner that he had reached a point where he was in command of at least 3000 men with only the rank of major. And now he was to be promoted to Lieutenant-Colonel not becuase he was one of the ablest commanders in the British army, but because King George IV had decided to confer an honour on him. Lt-Colonel was his British Army rank, he was to hold the rank of Brigadier locally. He had reached the limit of his promotion prospects. He once wrote: "I imagined myself to be serving a people who had no prejudices against caste or colour. But I find myself mistaken." As a result of his birth and of a career spent partly with the Marathas and partly with the British, Skinner moved between two worlds. His childhood memories of an Indian mother as well as his early years of fighting in central India, tied him to the Indian world. His domestic habits were more Indian than British; and he had a large family by, it is said, 14 wives. His town house in Delhi was a fine mansion with high colonnades in the classical manner, but with zenana quarters and Indian marble baths. At Hansi and Belaspore, in his country houses, he lived like an Indian landlord, taking a great interest in the cultivation of his estates. Many of his friends recalled the delicious Indian food, good conversation and relaxation with the hookah. He spoke the local dialect fluently and to the end of his life wrote Persian more easily that English. He knew the name and village of origin of all his soldiers, inviting men of all ranks to his feasts. He always layed an old spoon next to his plate to remind him of his humble origins. During the latter part of his life, he developed the friendship of high ranking British officers and officials. One of these men was Sir John Malcolm who said in one of his letters to Skinner; "I do not mean to flatter when I say you are as good an Englishman as I know; but you are also a native irregular, half born and fully bred; you armed them, understand their characters, enter into their prejudices; can encourage them without spoiling them; know what they can and, what is more important, what they cannot do. The superiority of your corps rests upon a foundation that no others have." James Skinner died in December 1841 at the age of 63. He was buried at Hansi with full military honours, his funeral cortege consisting of a long line of his beloved 'Yellow Boys'. Two months later his remains were moved to Delhi for a British style funeral. His final resting place is under the floor of St James' Church which was built with £20,000 of Skinner's money, the realisation of a dream and pledge he made as he lay in pain on the battlefield of Uniara. In 1857 the church was desecrated by the mutineers but they respected the tomb of 'Sikander Sahib'. A collection of Indian paintings that had been in the possession of the family of Major William Fraser was sold at Sotheby's in July 1980. They were bought for a high price by the National Army Museum, London where they are now. These are depictions of the world of Colonel James Skinner who commisioned them. The artist is probably Ghulam Ali-Khan. Two of them are magnificent panoramas, one showing the entire regiment returning from a review, the other showing a regimental durbar. Most of the others are of a non-military nature showing friends of Skinner and workers on his estate.